Molalla's Bolander Field was recently the site for a pretty positive event. 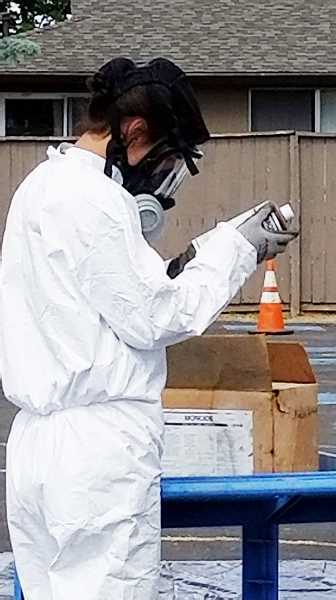 The first of June, pesticide applicators in the north Willamette Valley dropped off their old, unusable, or restricted pesticides for safe disposal. In total, 19,500 pounds of chemicals were turned in and are now safely out of the local watersheds. According to Kevin Masterson of Oregon Department of Environmental Quality, "About 25,000 pounds (of pesticides) were collected in Mt. Angel in November, so bringing in 45,000 pounds within six months from the North Willamette Valley is a good haul." Surprisingly, the quantities collected at these events remain steady. Since 2007, the total quantity of pesticides collected at events held in Clackamas County equals 151,915 pounds -- slightly less than 76 tons. Agricultural, commercial, and institutional pesticide users took advantage of this opportunity to get rid of their chemicals at no cost to them. Why do people have these pesticides in the first place? Some inherited old pesticide stocks when a farming operation closed down or transferred hands due to a death. Others found stores of chemicals when they purchased a business or property. Also, with the passage of time, some chemicals have become restricted or expire and can no longer be applied. Disposal of these stockpiles can be quite expensive. One producer summed it up this way, "Thank you. No really, thank you. These events are so important. It gives farmers the chance to responsibly get rid of their old pesticides instead of mixing them up and needlessly spraying them somewhere just to get rid of the product." The pesticide collection events, held across Oregon, provide safe disposal at no cost to the landowner. The funding for disposal generally comes from grants, as was the case with the recent collection event in Molalla. This Department of Environmental Quality grant was slated for a project that had fallen apart, leaving dollars on the table that needed to be spent before a specific deadline. Luckily, through a network of partners, the word spread of this opportunity and a successful event was realized using the leftover grant money. "Community events like the pesticide collections are successful because of partners working together. A big thank you is owed to all who helped," said Lisa Kilders of the Clackamas Soil and Water Conservation District. "The City of Molalla graciously opened Bolander Field to hold the event. Outreach and advertising were provided by the Clackamas and Marion Soil and Water Conservation Districts and the Pudding River Watershed Council. The Oregon Departments of Agriculture and Environmental Quality handled disposal funds and coordinated with Clean Harbors, the disposal company. Protecting water quality is a team effort."